Welcome to the 44th episode in our podcast series that’s about investing in tax-delinquent real estate specifically, but we also cover other REI strategies as well. In our business, we focus on properties where the owners have not paid the property taxes. As a husband and wife investing team, we’ve done more than 3,500 deals – in land and houses – with little competition and big profits. And we’re letting you in on how to do it all. Today’s episode is about scaling and growing your business by knowing exactly how to reach your goals. We’ll go through an exercise that explains how you can reverse engineer your biz based on what your goals are – in other words – you’ll back into the needs of your business in order to accomplish your goals. Grab a pen and paper because we’re showing you the exact calculations you can do to help ensure you hit certain goals. Jack: Hello everyone. This is Jack Bosch speaking and I have my wonderful business partner and wife Michelle here next to me. Michelle: Hello everyone, this is Michelle. Michelle: So we know a little bit about that. Jack: We know a little bit about that and particularly in the land flipping area, we have done not just 3,500 deals but we have also a time period of several years where we literally did something like 50 to 60 and some months in the 100 deals in a month, so we know a little bit about scaling your business and really also back tracking into revenue numbers, deal numbers and what needs to happen in order to hit certain goals. Michelle: Yeah, we had a window of time that was limited. Jack: Right, we had the window of time that the bubble would burst at some point of time and we knew we needed to really jump in and give in our all in that time period, otherwise we would always and forever regret not having taken advantage of that opportunity, so we knew we needed to grow big but we didn’t know how, so one of the things that if you remember we did back then is we ask ourselves one question and that one question was, well what would it take or how can we sell 10,000 properties a year and by the way we never got to 10,000 properties a year. Michelle: But we did get to a 1,000 from a 100. Michelle: One a quarter, basically. Jack: …Readers, registration people, you name it, there was even the VIP area for our repeat customers, you name it, it was a big organization that needed to be moved for that day, but it was all worth it. Michelle: And the idea you know to talk about this came because we had a couple of one-on-one coaching students with very aggressive goals and which we were absolutely excited and delighted yeah to see because more than usual you know what we get is all I want to do you know 5, 10, 20, 30 deals a year, I want to make X and it is basically somebody that wants to become a hobby investor versus an actual profession investor, yeah. Michelle: Because you know even though it may be like Jack said one deal and it could be a small spread but those small gains really sculpture spirit and give you the confidence to go for larger and bigger goals, small aggressive goals yeah, so they are just as valuable. Jack: Absolutely. So at the same time we are very excited to have this couple of coaching students in our program whose goal is to get to I think $2 million next year, actually this year already. Jack: $200 or $250,000 already in profits and basically they came to us and said like how do we do this, how do we generate $200,000 profit in Q one and then 300 in Q two and then 500 again in the other, in the rest of the year and then go to $2 million next year and then $3 million the year after, we are like, hey finally somebody that really has similar ambitious goals to what we have accomplished so what we did is we went with them through an exercise that we just want to illustrate on this podcast. Michelle: And its basically an exercise where you reverse engineer based on what your goals are so in this case you know by Q one which means by the end of March of 2016, you know they wanted to have $250,000 in revenues and so what we identified was okay if this is what you want, we have to establish certain parameters or we need to make certain assumptions in order to back into how many letters need to be mailed, how many offers need to be made you know and end of that how many properties we are actually going to buy and what is the average you know amount that we are going to make on each of those properties. Michelle: …and then the amounts of profits per deal and so basically using those three assumptions, which in our case because we have a lot of experience you know with large numbers, we could give them some guidance. Jack: Because there is variations that around the country from county to county, from area to area on those numbers. There are areas where you can get where you fully accept a 10% acceptance rate on all your deals meaning you make a 100 offers you get 10 properties and there are areas where you send out a 100 offers and you get one or two acceptances so we had to kind of like play with the these kind of parameters and find kind of a middle range for that. So we started out with the amount of profit per deal so that we can go and see how many deals that we need in that time period to make $250,000, so by starting with that we let’s say we came to a conclusion that out on a conservative side on average, an average deals should make you anywhere from $5 to $20,000, let’s take an average of $10,000. Michelle: And then in order to make their $250,000 then they would need 25 properties. Jack: They would need 25 properties, now this is very conservative because chances are, in all our experience and all our students experience typically when you do 25 deals, you have got some in there where you make $4 or $5,000 but you also have some in there where you make $30 or $40 or $50,000 and they well over compensate for the $3 or $4,000 so it is conservative fully counting but hey we rather want to be positively surprised and have them make $300 or $400,000 in the first quarter then falling short of their goals. So, therefore, we said okay, so now with that we figured out it is 25 deals. So now with 25 deals, we need to next look at the acceptance rate of that we get for offers so how many offers do we have to make in order to get 25 deals accepted? Now as I said just a second ago or as Michelle said, I don’t remember who said it that the acceptance rates vary, in some areas they are up to 10%, in some areas they are 1%, so let us say if we take an acceptance rate of 3 to 4% it means for every basically 100 offers we make, we get about 3 to 4 deals accepted. Now that is again low, but is very reasonable so that means that you basically for every 25 offers that you make you get one accepted, 20 to 25 offers you make you get one accepted and that is pretty cool and that is without any follow-up and that is without any second letter and additional offers and so on, so there are ways to boost this by adding a little bit follow-up to that. So if we just say, if 4% acceptance rate, then basically we send out a 100 offers, we get 4 accepted, so therefore if we send 200 offers, we get 8 accepted, 300… 12, 400… 16, 500… 20, and at 600 we have 24 deals, so we need to send about 625 offers out there, right so far so good. Michelle: Yes. I am just confirming with the calculator and yes he has got it right. Michelle: 625 offers that means you need to have had at least 625 people call you back but only a percentage of the people that call you back will they actually you know accept an offer so how many people do you need to actually send that letter to, you know in order to have the 25 properties that we have. Jack: And that depends on the actual response rate of the people and the response rate in this case again conservatively and realistically with our land investing method, they came for land investing and the housing world that looks different, whether or not land investing method can be tagged at least 10%. Everyone should be getting using our methods about the 10% response rate on their letters. So that effectively means that in order to make 625 offers, you need to be able to send 6,250 letters. So 6,250 letters is the very bare minimum that we need to do now. By the way, sometimes you get people calling you back saying that they really don’t want you to low wall them on their offer and if you want to give him a low offer to rather not send him an offer at all, or they just mean to you or something like that, so basically if we make not on every phone call that comes back an offer but only about like 80 to 90% we can round this perhaps up this 625 to perhaps 750 perhaps, we need to get so therefore 10%. Michelle: You have some trophy property there. Jack: …That you have some properties that you don’t buy until or you don’t even close, you don’t even get the contract back until the mid-March and that therefore it might take a little longer to actually sell absolutely, but the properties that come in January, you should be able to sell those by the end of March. So with that, we have now the number of 7,500 letters. Michelle: Yeah. And what that meant is that when we basically reverse engineer this for them, they needed to find, they needed to basically come to a moment of truth on whether they would be able to basically manage to service all of the inbound calls themselves or will they need to basically outsource this to some kind of a call center or have two or three people that would help them you know take the inbound calls, do the research and prepare everything for them so that they could actually then focus on the offer making and on the sales process. Jack: Exactly, because at this point, you go and look and here is what it takes, it takes 7,500 letters in a three months period or roughly, let’s say it takes about 2,500 letters to be exact actually 2,500 letters a month. In order to send 2,500 letters a month, you can basically go and three months or 13 weeks you can basically go and send something like 500 letters a week, and by the time you get to the end of the quarter, you have sent out 7,500 letters or if you want to front load it a little more in order to get those deals in faster, you can perhaps send a 1,000 letters a weeks or 2,000 letters every two weeks and in this moment, we are getting into a bottle-neck analysis. Michelle: Yeah. And the bottle neck is basically can you then receive all the inbound calls that you are going to be getting from people opening that letter and actually saying yeah, you know what, I am interested in selling my property, let me call these guys up, yeah. Michelle: Yeah, you have a first class problem. Jack: Absolutely, I mean this is all with problems, so the answer to that if you hire call center, the answer might be absolutely yes, if you are not hiring a call center, you might want to have to look at who else is going to take those phone calls, you need a phone system, you need to book rate your own call center because you are going to get something like 200 to 250 phone calls a week that need to be handled by somebody, if that is your goal, if you have these high goals. Michelle: And for us, we had to even go to the granular level of saying okay if each of these properties because you right now you are going to have to train someone and that person is not as skilled and as fast and quick doing this as you will, it will probably take them you know anywhere from 20 to 30 minutes per property and that means that that person can do you know four an hour and that means that this person needs, that you need you know 40 something hours or whatever it is, 60-70 something man hours of a person actually doing value analysis for you so that you can go and actually make an offer. Jack: If you get 250 phone calls a week and somebody can do four value analysis an hour at 15 minutes apiece then that means that is over 60 man hours of value of comp analysis that needs to happen. So the question to that to you listening to this podcast is if this is your goal, are you set up to setting this up and that is the same question we ask our students. Michelle: Yeah, and for us it was like okay, it was a need for them to, they needed to staff and they needed to over staff to basically to plan for people that are just not going to work out so they can still meet their goal, yeah, so over staffing for us was one of the solutions that we had for them in this particular area of the process where we identified the next bottle neck. Jack: Exactly and with that we then came to the conclusion that okay, they are willing to do that, they already had some of that, they realized they needed to decide to hire 3 more people to actually get that. 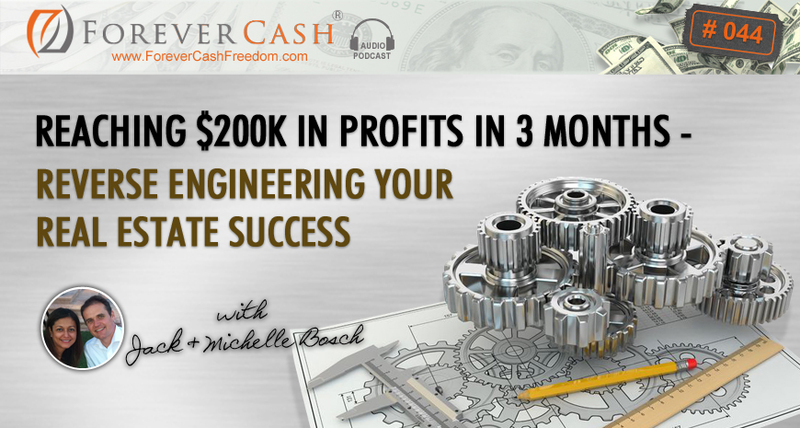 Michelle: Because once you do that, you can identify costs you know and how much it is going to cost you in mailings and man hours doing value analysis, you know the cost per letter, I mean you can really get this to a very specific science on to what you are costs are going to be and what your profits are going to be. Michelle: Process is a mental exercise, it is an intellectual exercise. Jack: Right, and build that process of what are the different steps, where are your short step, where will you not be able to handle that flow of 250 different offers that come through a week and a part of that we talk to them about how to best make the offers but we will talk in a different podcast about that, how to get more offers out quickly and so on and so forth but in combination, this entire exercise was an exercise in basically re-engineering, peeling the onion back and actually re-engineering going from reverse engineering the process from the outcome all the way to the requirement of how many letters do I need to drop in a mail. Michelle: Absolutely because I thought this is so valuable for somebody that is basically wanting to do this you know much more seriously than just hobby investing which you know there is nothing wrong with that but if you are interested in doing this on a different scale then this is pretty much the process you know that you go from. Michelle: Also I know that you got a lot of value from this podcast today, I am certain of that and I am asking you to go ahead and give us feedback and rate our podcast and give us five stars. Jack: All right, I would love that and Michelle, the power in the house spoken, she wants you to do that and I want you to do that, so please go ahead and do that, we would love that and with that, I just have one extra thing to say and that is we have officially added again something different on our ForeverCash.com/Freedom site, we get free access to a program with multiple free courses, we have added it is called MyOpenPath.com and you can actually set up a free demo account there. And when you do that you actually get full access to four complete courses in the tax-delinquent real estate plus you get to download the audio book of my bestselling book Forever Cash. And there is no credit card requested on there, there is no ins or opts or anything like that, there is just a free account that you can set up there called the free demo account and if you go to MyOpenPath.com and check it out, we would love to have you on board there and see you take advantage of those four complete courses on tax-delinquent real estate investing, right then with that we say thank you and bye, bye.